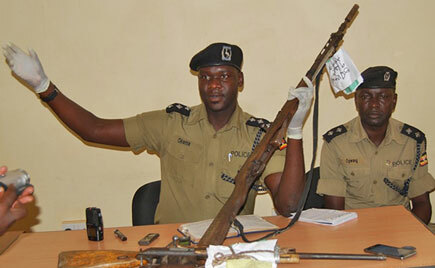 KITGUM– Police in Kitgum district has recovered two guns that were stolen from Agoro police post in September this year. The recovery took place on Saturday 10 at 11:00 am in the Westland ward, Central division in Kitgum Municipality. Patrick Jimmy Okema, the police spokesman for Aswa region confirmed the incident and said the gun and several properties were got from a home of one commonly known as Okimbo, however, didn’t find Okimbo during their operation in relation to guns. “We recovered AK47 UG POL 563619899-10849 and AK47 UG POL 051487-07506 with three magazines loaded with 87 rounds of ammunition. The region’s police spokesman added that three suspects were also arrested during the crackdown operation. “We managed to arrest three suspects identified as Angel Harriet Apiyo who happens to be Okimbo’s wife, Samuel Ochola and Ikwera Nono. The trio is in our custody at Kitgum Police station” he added. He recalled that Apiyo was formerly a wife to a suspected robber Lawrence Tima-kica who was killed a few years ago by an angry mob in Kitgum town after he escaped from police cell.